I am confused on how to rate this. There is no denying that Hodge created a beautiful, interesting world with an interesting history. The characters are flawed, yet wonderful. The ending felt a little fast, but I still liked it. I’m not quite sure that it’s “Graceling meets Beauty and the Beast,” but it’s still a captivating read. Nyx has known for most of her life that she would be the sacrifice. Here sister is the beloved daughter and she is the useful one kept at a distance. She knows she will be married to the Gentle Lord, the one who rules all demons. She knows she is expected to destroy him, and in the process either be trapped with his forever or die. Nyx has never felt loved or valuable to her family, something that plays an important role later in the story. She’d developed a tough skin and an even tougher heart. She knows that if she doesn’t let herself care for anyone, no one can use that against her. Nyx fascinated me as a character. Her father has never shown her much love, instead showering her sister with affection while training Nyx to be the revenge he desires upon Ignifex. Nyx and her sister were part of a bargain their father struck with Ignifex, but it cost him his wife. As revenge, Nyx is supposed to marry and destroy him and his castle. Her father’s desire for revenge leaves no room for compassion and love for Nyx. She’s angry and hurt. She wants someone to feel for her situation. She feels like she is not a person, just a tool. Ignifex somehow breaks her down and reveals a different side to Nyx. She suddenly has someone she wants to care for. She’s meant to destroy him, but finds common bonds that make that task difficult. The main fault I find between Ignifex and Nix is that they barely spend much time together before it becomes love. I wish the relationship had been developed a little more right from the beginning. The world building was done well. There’s some Greek mythology mixed with the Beauty and the Beast elements. My favorite piece was the castle, though. It’s forever changing, revealing new secrets and hiding others constantly. I loved reading Nyx’s wanderings of the castle. Everything was so vividly described I could picture it all easily. The castle is its own character. In the end, despite how I loved individual pieces of the novel, I didn’t fall head over heels in love with it. It was good, yes, but not amazing. I think the Beauty and the Beast elements will really draw people in. It’s a lovely and well-written novel, just not exactly what I thought I was getting into. Still worth a read for the imagery alone. Everything else is just an added bonus. 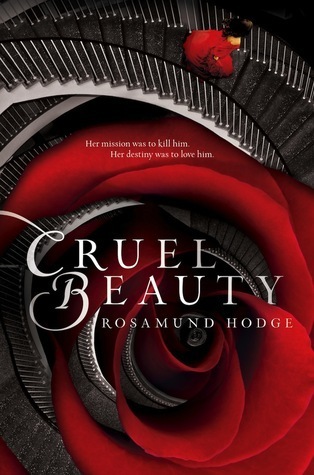 This entry was posted in Historical Fiction, Something a Little Different, Young (and New) Adult and tagged Fantasy, History, Mythology, Rosamund Hodge, Young Adult.